Metso is searching for an undergraduate trainee to work in Metso’s communications and stakeholder relations team. The length of the position is approximately seven months, starting at an agreed date in November 2018. The candidate we are looking for has communications as a major subject or at least a minor subject. Studies in marketing or international business are a plus. You are fluent in English and you have the ability to work independently and take ownership and responsibility. You have basic knowledge of video production or willingness to learn (Adobe Premiere knowledge is a plus), also basic knowledge of Sharepoint is an advantage. In order to thrive in a dynamic environment, you are well organized and structured but can also flexibly adjust to varying situations. The position is full time and based at our head office in Helsinki. 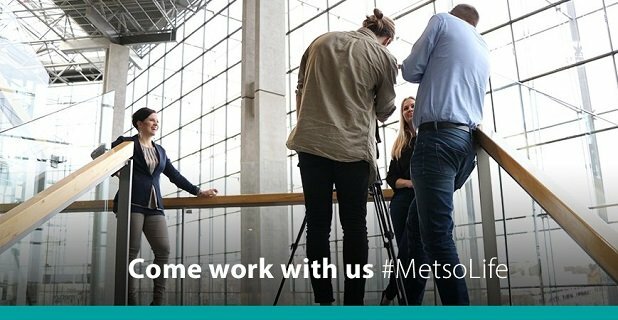 We offer you a highly interesting position in Metso with a chance to get insight and learn a lot from a professional team of communications, sustainability, investor relations and brand professionals. Metso operates in a dynamic international environment and you will get valuable experience from a company that is a leader in its field. For more information, please contact Inka Törmä, Communications Manager, Newsdesk, tel. +358 400 218 929 on Monday 29th October at 3-4 PM EET or Thursday 1st November at 10-11 AM EET. Please send your resume and application via Metso Careers page latest by 18th November 2018.